The High Sierra 10.13.6 update is the sixth major update for macOS High Sierra. This update adds AirPlay 2 multi-room audio support for iTunes and iTunes 12.8. Other than that this is a very minor update with a number of undocumented fixes, improvements, security enhancements to macOS. This is a minor update and the last one until Mojave comes out this Fall. Since it’s a very minor update with many only bug fixes no changes should be needed to be made to the EFI of your hackintosh. Warning: Updating to 10.13.6 will cause your drive to be converted over to APFS if it was HFS+ before the update. This wasn’t the case with previous update and is something Apple sneakily put in place in a more aggressive approach to getting people to use the Apple File System or APFS. AS of now HFS can be used on Mojave so for you guys that don’t want your drive converted it may be best to wait until 10.14. Those already using an HFS+ drive will have their drive converted over to APFS updating to 10.13.6 so it’s a good idea to have apfs.efi or a combination of PartitionDxe-64.efi + ApfsDriverLoader-64.efi in drivers64UEFI folder. 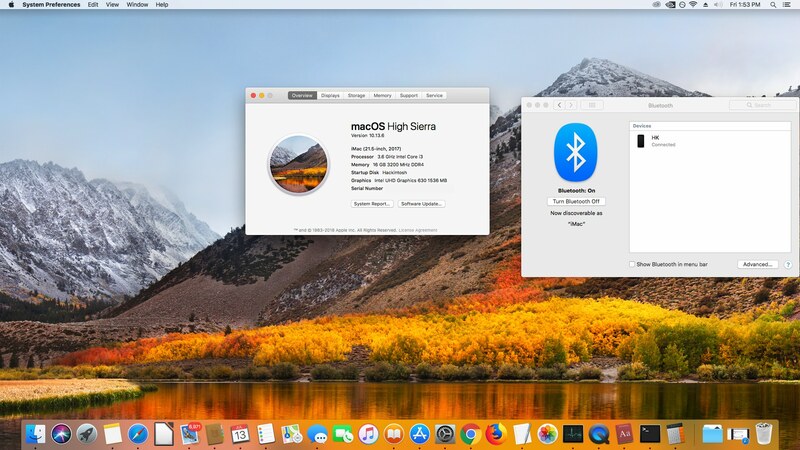 69 Comments on "Hackintosh High Sierra 10.13.6 Update Guide"
Have a BCM94352Z card and this update broke my bluetooth. Bluetooth just says “not available” in the menubar. The card itself shows up in the USB section of System Information but there is no information available in the Bluetooth section. Are you able to check if iMessage/iCloud is not working as well? There’s a chance it could related to your SMBIOS. Yeah not too sure why. After the initial install Bluetooth works but after I rebooted after the update Bluetooth was gone. I’m using the igpu with coffee lake i7-8700k with smbios 18,1. Do you have any suggestions as to what smbios I should try? Found a solution thanks to @RehabMan. Copied BrcmPatchRAM2.kext and BrcmFirmwareRepo.kext to /L/E, repaired file system permissions, rebuilt kextcache, and BT is working. Found out after many years that it is not always good to install all kexts to Clover only. Hope it helps other. Update went well, from 10.13.5 with only one restart without the clover menu at the begining and one restart at the end. Unfortunately HFS+ transferred to APFS. USB not reliable now, sometimes mounts the connected HDD or SSD sometimes doesn’t. For 10.13.6 you will need the new USB Patch to fix your issue which I added a section for. Thank You! You saved me some nights. Works perfect! Now how can I go back to HFS+ from APSF without reinstalling everything again? No unfortunately not. But you may be able to clone the drive to a HFS partition, but I’m not sure. No one seems to be talking about the automatic conversion on other forums and I didn’t even notice it happened to mine too until you brought it up. Yes the KBL buffers need to be edited every update because they are overwritten every time. In Mojave Apple added the Id’s into the KBL frame buffers so we’ll no longer have to edit them to get our Coffee Lake i3’s accelerated. I’m currently running Sierra 10.12.6. Should update first to 10.13.1 and then to this or can I go straight from my Sierra to this 10.13.6 update? Thanks. Don’t forget to update all your kexts. Do you think is it still better to stay on HFS+? Unfortunately Disk Utility can’t make disk image from APFS. I tried with CCC before your fix, but did not work out. The startup failed at the end on HFS+. I also had a question on Graphical Acceleration some days ago, could you look into this for me? Using the Intel i7-8700 CPU and the Gigabyte Z370N WIFI ITX motherboard. Do I have to do step 8 with this CPU, to have Graphical Acceleration? How can I check Hardware Encoding and Intel QuickSync? Do you manually type in the USB fix information, because I don’t see it in the latest Clover Configurator (5.1.3.1) drop down. Patches are manually entered just copy paste what I posted above into each column like the image. Ok, sorry because I am a Hackintosh novice. Do I need to download the update and copy that to the original clover USB that I used to setup the Hackintosh originally? I downloaded via the app store update, clicked reboot but only saw 3 options and none of them were Install macOS from “drive_name”. Sorry, I just got my original Hackintosh built 3 days ago after attempting it almost 1 year ago and putting it to the side. I was not using the original usb, just the bootloader that I installed so I could boot without the usb installed. First of all, thank you for the quick replies and for not making me and other freshies feel dumb. Basically what you are saying happens is what happens but in the bootloader, i see 3 options left to right in clover bootloader. I have tried the first two options several times when OSX comes up it still shows as 10.13.5 and still has the update in the app store to download. Again… Thanks! This site has been a big help to me getting my Hackintosh working the first time. The second option “Boot macOS Install Prebooter from Preboot” shows loading progress then takes me to a “macOS could not be installed on your computer” and has me reboot. I am attempting this one more time and making a video. There is not a 4th option, only the ones I listed above. I got this upgrade. Just for documentation for anyone else. In my case, I did not have 4 options only the 3 listed. I had to pick the second option “Boot macOS Install Prebooter from Preboot” about 3 or 4 times and it finally worked. Again, thanks for the help! This update from the appstore (coming from fresh install on 10.13.5) broke my audio again, the rest appear to be working fine… any hints? cause all the changes on the config.plist seem to still be there in the EFI… or maybe there is a new audio patch? I am also having the same issue. My PC configuration is an i5-6600k, RX 480, Asus Z170-A, and 16GB RAM. Anyone else having a glitch in the graphics? After updating my system from 10.13.5 to 10.13.6 using the combo Installer the NVMe drive partition was left with HFS+ (macOS journaled). Is it possible? Also my BT is broken just as for andrew_leonard. Can it be related to NVMe drive? The full version of the 10.13.6 install app, converted to APFS for me. But not this time ! Well… I tried booting from Recovery, broken. From TimeMachine, broken. Tried reinstall 10.13.6 from a brand new USB stick properly configured for the occasion… broken. I don’t understand what happened to my hackintosh during this update! Anyway, I had no other solution than format everything and install 10.13.6 from scratch. Doing it right now, seems to go as it should… Will keep posting here for any other poor dudes like me in close future ! After massive headaches trying about everything possible to install Nvidia drivers I eventually discovered that the problem was coming from too recent version of Lula or NvidiaGraphicsFixUp kexts ! I had updated to latest just before… I downloaded older versions (4 or 5 version before to be sure) and my computer work perfectly… so I’ll take the time later to identify which kext is causing trouble and from which version it’s not bootable anymore… just to help other people in my case in future… Let you keep posted ! Actualicé correctamente mi hackintosh de escritorio siguiendo esta guía. Lo que yo hice fue: Primero descargar y copiar en mi partición EFI, en Clover/Kext/Otros todos los kext´s recomendados aca: comparaba las versiones que tenía instaladas vs las descargadas y así las actualicé uno a uno, descargué también el NvidiaWeb, lo quise instalar antes de actualizar, pero me salió un cartel que decía: “esta aplicación requiere 10.13.6″ Así que supuse que debía actualizar y luego instalar, cosa que hice d einmediato, la actulaización. Sin varios reinicios tardó unos 10, 15 o 20 minutos, no tengo en claro porque en pantalla aparecía que tardaría unos 42 min y después se fue reduciendo, total que fue sobre unos 20 min. Al ingresar, tengo la impresión como comentaron algunos, que se quedó y no modificó el sistema de archivos en HFS+, arrancando me decía que NvidiaWeb estaba desactualizado, entonces lo instalé de inmediato, reinicié y walá todo espectacular: mi Hackintosh es una PC armada con Asrock Z97 Pro4, intel Core i5 4460, 16gb a 2400mhz, SSD Sandisk 120Gb, conectado a un monitor Dell 27” HS2717. Espero esto le sirva alguien. I still have no Bluetooth after upgrading to 10.13.6. I have a duplicate drive with the same kexts, Clover. and config.plist with 10.13.5 and Bluetooth works fine when I boot it. I have moved kexts to other locations as described in the Help Me thread on this problem. Not sure what else to do. Hello, sorry for the English, I do not write it very well ..
Can I install macOS high sierra without problems? or am I going to present problems such as sound and internet and black screen? Followed your guides last year to get up and running on a fresh 10.13.1 install. Everything was perfect. I updated to the latest 1.2.5 Lilu.kext to install the 10.13.6 update. The update went smooth but now my audio doesn’t work. I updated the AppleALC.kext to the 1.3.0 version and that fixed my Audio! Version 1.2.7 of AppleALC.kext is what fixed audio for me! Also i was slightly unclear on when i was supposed to make clover/kext changes. Is there protocol for this? Thanks again for all the great help and info! Any word on if risen cpu users can update? This is odd. The USB patch restored my previously broken (intel) bluetooth, but busted my USB3.0 SATA Dock. My front panel USB3 isn’t working either. I tried with a USB3.0 Flash Drive. All my USB ports seem to be working in USB2.0 only. Is there a fix for this? Any infos on ultra wide screens working in this one? Updated to 10.13.6 before reading this guide. USB 3.0 wasn’t working, found your fix, but my USB 3.0s still aren’t working. Any help would be much appreciated. Thanks. Running your GIGABYTE Z370 AORUS GAMING 7 build and this isn’t the first time I’ve updated High Sierra but now at the Apple logo the progress bar gets to half way and then the computer restarts. I’ve got this PC dual booting with Windows, is there anything I can do from the Windows side to get the hackintosh to boot? Having a similar issue. But my newly updated High Sierra option gets nearly done launching then restarts. No idea what’s causing this. Update from 10.13.4 to 10.13.6 went okay after a few false starts. Had to remove PCI cards and use iGPU to get past a hardware detection error, and then force clover to select an install boot option through 3 or 4 restarts. It wasn’t made the default boot option in clover, so I was going in circles. Nvidia webdriver update was smooth. Now just working on audio kexts again, which is an ongoing irritant on my dell optiplex midtower. For anyone having issues installing Nvidia Web drivers on 10.13.6, I highly recommend this simple utility called webdriver.sh: https://github.com/vulgo/webdriver.sh. It’s incredibly simple and configures whatevergreen correctly if needed. Thanks for posting this update! I had accidentally updated from 10.13.1 to 10.13.6 and started to get a boot loop. I followed these steps and updated the kexts and brought it back to life. Thank You!! I can’t seem to get my USB 3.0 ports working at all. I’ve done the USB Patch for 10.13.6 and checked it over 3 times, to no avail. I’ve also updated all kexts. USB 2.0 ports work fine. I did a fresh install of 10.13. Below is a link to my config.plist via Dropbox. Any help would break greatly appreciated. I started to experience a problem with After Effects CC2018 after upgrading to CC2018. Basically, It crashes on the creation of a new composition saying Open GL error. I haven’t a clue how to fix this, can someone please help. I have OSX 10.13.6 installed, my computer has Nvidia 1080 Game Rock Palit Card. (NVIDIA GeForce GTX 1080 Ti 11263 MB). The system works fine, but I have noticed glitches when new finder windows are open. The biggest problem is that After Effects is not working. I got a black screen after I clicked on Install mac os drive! Now the system won’t load. Hi, man. I’m new with Hackintosh science. Thanks to this post I have my USBs 3.0 working in my computer. I’ve read that the new clover versions remove the OxsAptioFix2Drv-64 driver and that there is a workaround by installing ApfsDriverLoader-64 and AptioMemoryFix-64. However, i also read that this would make the apfs.efi file obsolete. Is this true? Or do i still need to load the actual apfs.efi file? i have success made update from 10.13.3 to 10.13.6 via appStore Updates, at process boot (temporary having new option in boot like install mac os – need to select this one), also have one fail and reboot PC, but for total is done – okay. Before make update i was make renew kexts in EFI partition to latest versions. After PC is boot success, then appStore auto-update ask me for install another security update, i was click ok and restart, next i was have two fails and reboot at process of install security update. Thanks, worked perfectly in my Optiplex 790, didn’t do any change so far over the normal upgrade. What’s more, now the system DOES shut down; previously it would reboot.